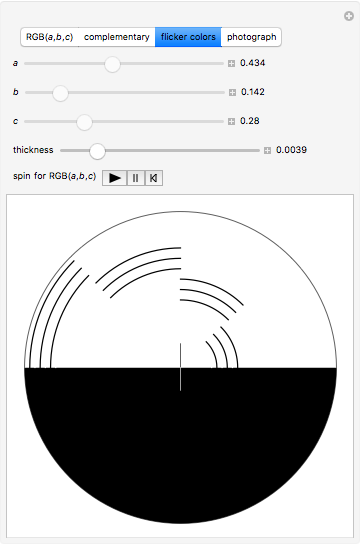 This Demonstration shows disks for making spinners. Print and cut out a disk, make a hole in the center, put it on a small spindle or pushpin and spin it. The " " button has a disk divided into three sectors colored , and . The smaller disk in the center is colored . When the spinner rotates quickly, the whole disk should appear colored by the same color, . But that is generally not true; evidently, mixing colors by rotation is not the same as mixing colors for print. The "complementary" button shows sectors that are colored by complementary colors and . So the rotated disk should appear white, but this is not always true. The "flicker colors" button has a disk that produces optical illusions caused by motion. When the disk spins, you will begin to see yellow in the inner half and blue in the outer half (or vice versa). The "photograph" button shows a picture of two completed spinners. 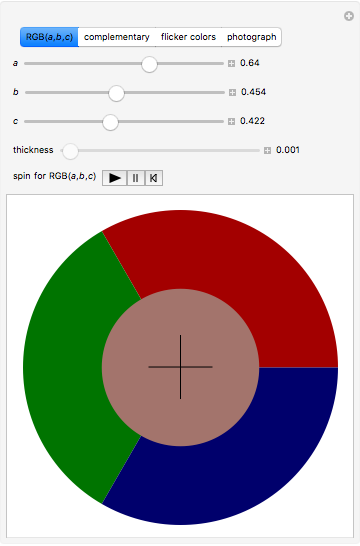 You can click the "spin" trigger to set the RGB disk in motion. The effectiveness of the observed color mixing depends on your computer's processor speed. 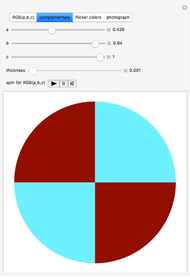 Izidor Hafner "Making a Color Spinner"